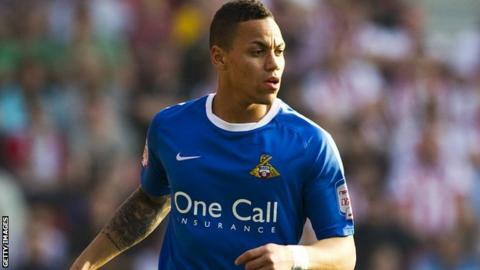 Doncaster Rovers winger Kyle Bennett is confident they have the quality to go on and win League One. Bennett came off the bench to score a last minute winner against Shrewsbury on Tuesday to send Rovers top. Doncaster's win on Tuesday saw them go from fourth to first in League One, while Bournemouth who were top this time last week are now seventh after successive defeats. Victory at Greenhous Meadow gave Brian Flynn's side their first win since 19 January. "It is going to be really tight but I am confident that we genuinely have a strong enough side to be up there," he told BBC Radio Sheffield. "It was important for us to get a win and we've done that now so hopefully we can pick up some momentum. "If you'd said at the start of the season that we'd be top at this stage of the season then we'd have snapped your hand off." The 22-year-old praised the impact that Everton loanee John Lundstram has had since joining last week. Lundstram, 19, is on a one-month deal from the Premier League side. "He has been absolutely magnificent, it is like he has a sat nav on his right foot," he added. "He's a young lad and this is a good experience for him so hopefully he can kick on." Doncaster, who are now two points clear of third-placed Tranmere, host improving Hartlepool on Saturday.